A woman and her father struggle to survive and talk of a war in the human colonies. The Sixth Doctor takes Mel to the opening of humanity's tallest freestanding structure: Kalsos Tower. The arrive dressed for dinner and naturally end up in the war zone. They get split up while exploring and a cave-in separates them. Mel runs into a soldier who informs her that the Tower is being demolished. An impressively contained episode considering they travel between three planets without using the Tardis. The first half is so strong that it makes all the inconsistencies at the end all the more apparent. Three stories are juggled and merge into one, but that's not where things start going wrong. It gets to the very end and just goes stupid, but more on that later. There is also a news broadcast, which serves as propaganda for the residents, but not more than any other news agency parody. The Sixth Doctor is not in top form. He gets shafted with being out of character for most of this story, which is its real downfall. When the Sixth Doctor gets his charisma and gravitas taken away from him, it takes much of the fun from the script. It also makes the Doctor feel like more of a non-entity. Mel is the emotional heart of this story. She develops friendships with the locals and even as something of a romance bloom with Barlow. Unfortunately, she doesn't get much to do aside from that and is almost written out of the action on Earth. Barlow is a soldier for Earth tasked with setting charges to blow Kalsos Tower. He and Mel develop feelings for each other, but the plot conspires to keep them apart. Sisrella is the other emotional link in the story. She gives us the point of view of the common folk as she and her father try to keep from starving. She gives a solid performance, but has little to do aside from trade barbs with an ex-beau and chat with Mel. The Eminence and the Infinite are more hyperbole than anything. They have cool names and a legendary history, but definitely don't do much in this story to back it up. Some creepy lurking and lots of whispering. The Eminence has some solid ideas, but bets them all on the heroes' stupidity: smooth. The collapsing tower and the riot scenes are surprisingly easy to follow. All three locations feel different; something that becomes all the more impressive on audio. Doctor allows some stupid deaths to occur due to some bad planning on his part. Also, the Eminence's plan relies on way too many variable, but then again "pride goeth before the fall." There is some genuine heartbreak from Mel over how things end, but it becomes more frustrating given that it concludes with a final retort from the impotent villain. It's surprising to see that two writers are involved in this one, and I'd be interested to see if it was literally half and half or a collaboration. That being said, the parts mesh nicely; I'd just like to know who to blame.It's a fine Sixth Doctor story, just not up to his audio heights. 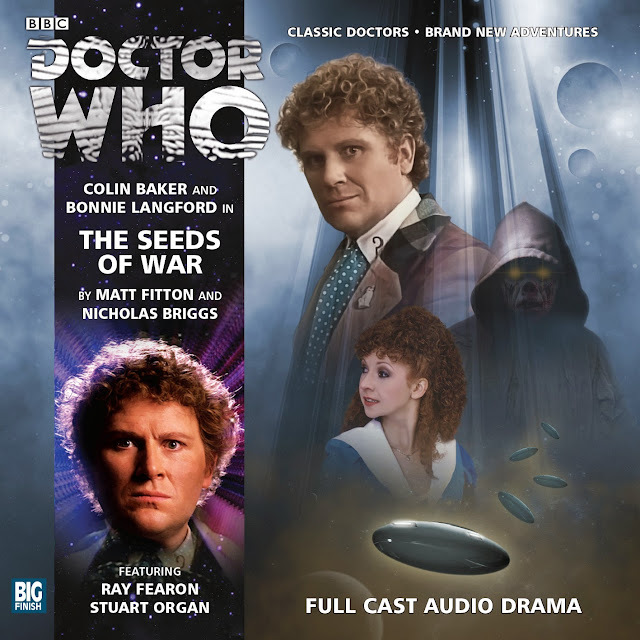 Get it from Big Finish!